Three teenagers had a lucky escape on the Kāpiti Coast yesterday afternoon, after being blown out to sea in inflatable boats. 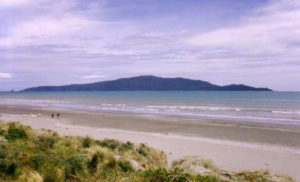 The three young people were in separate inflatable boats at Waikanae Beach early in the afternoon, when they were blown out to sea. None of the three young people were wearing life jackets, and the boats were described as “not seaworthy”. When Police were called just after 1pm, the boats were reportedly around 300 to 400 metres off shore. While the sea was described as relatively flat at the time, there was a strong southerly wind and the boats reportedly blew out to sea very quickly. Police, Coastguard, Surf Lifesaving and the Westpac Rescue helicopter were all deployed to assist with a rescue. Fortunately, the teenagers were able to get back to shore under their own steam, using two small paddles they had in the boats, and the rescue teams were able to be stood down. Acting Sergeant Kieran Rawlinson, who attended the incident, says it was a great relief that the teens made it back to shore safely. – Be prepared – know how to swim confidently. – Wear a lifejacket when out on the water. – Be aware of hazards – obey warning signs and do not enter the water after drinking. – Know your limits – if in doubt, stay out!